Also known as Hajime no Ippo, Makunouchi Ippo Helps his mom at a fishing dock, he is currently in school and because he has to help his mom he couldn't make very many friends if any at all. Walking home from school a bully named Umezawa-kun and his two friends walk up to Makunouchi and as always he doesn't try to defend himself and leaves an open weak point for being bullied around and this is where Makunouchi gets beaten up pretty bad and Takamura-san comes to save him. The bullys run off in fear of Takamura-san and Makunouchi passes out1. He wakes up in the gym and before leaving, Takamaura-san tries to help give him the courage to defend himself by putting a drawing on a punching bag for Makunouchi and he punches with unbelievable power and thus reveals the type of fighter he would become. Now he gets some video tapes of some boxing matches and starts to desire the idea of becoming 'strong' and begins to buy boxing magazines and now his desire and respect for the sport grows. He meets up with Takamura-san on the road side, here he says he wants to become a Pro Boxer, Takamura-san thinking he doesn't have the ability to become anything good he tries to stop him from doing it, but Makunochi doesn't give in so Takamura-san gives him a really hard mission that normally he wouldn't be able to fulfill, having to catch 10 leaves while they fall from a tree.. Now, along with new friends, they work to conquer the kitchen fridge! The kind and easily intimidated titular hero of the series, Ippo wishes to become stronger, both physically and mentally. 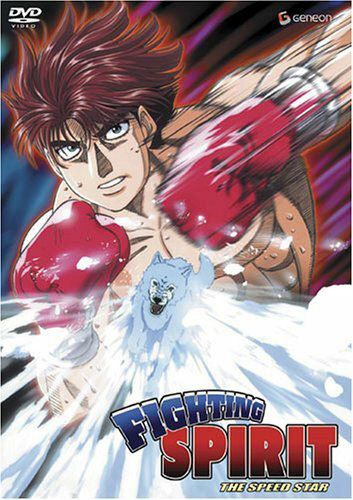 As fate would have it, he meets Mamoru Takamura who introduces him to the world of boxing. From that moment on Ippo tirelessly trains to become a pro boxer and overcome his fears. 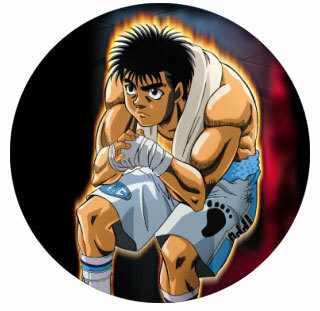 As a boxer, Ippo's greatest strength lies in his undying willpower and his natural physical strengths, which include monstrous stamina through training, and raw physical power. Whenever he can, he helps his mother (Hiroko) at home with the family charter boat fishing business. His current record as Japan's featherweight champion is 22?1?0, with 22 KOs and is ranked WBC #12. Ippo's greatest rival. Not only is the taciturn Miyata a boxing prodigy, but he is also blessed with good looks, amazing reflexes, and nearly unmatched speed. He began at the Kamogawa Gym, but later transferred to Kawahara Gym in hopes of one day facing Ippo in an official match. Miyata trained all across the Pacific and eventually returned to the mainstream boxing scene as the OPBF (Orient Pacific Boxing Federation) featherweight champion. Miyata's record is 22?1?1, with 20 KOs. Miyata himself looked down on Ippo a little at first, but after he helped Ippo to buy new boots for their first match, he started to respect him more, developing a friendly rivalry. Head coach and founder of the Kamogawa gym. He fought as a prizefighter in Japan shortly after the end of World War II. Along with his friends, Ginpachi Nekota and Dankichi Hama, Kamogawa developed a style of fighting that both presumably became the forerunner of boxing in Japan and emphasized scientific theory in its techniques. As a coach, Kamogawa's wealth of knowledge and experience has been tapped into on multiple occasions during training as well as in matches. Although he rarely admits it aloud, he is extremely proud of his two best boxers, Takamura and Ippo. A veteran boxer who introduces Ippo to the sport after rescuing him from bullies. Gifted with incredible physical ability, he is considered to be one of the very few Japanese boxers that can make it on the world stage. As a result of his incredible skill, Takamura has an equally large ego and is not above bad-mouthing his enemies, teammates, and even Coach Kamogawa. He is the estranged son of a family that runs a large line of successful hotels and resorts, and was quite a troublemaker until Coach Kamogawa managed to get him out of a life of street violence. Currently, Takamura has a record of 21?0?0, with 21 KOs, and is the reigning WBC Middleweight Champion, and former WBC Light Middleweight Champion. 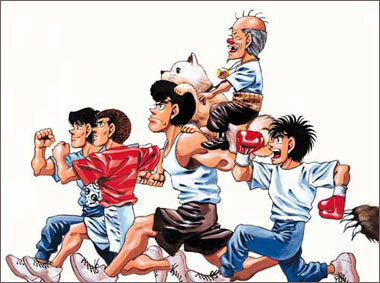 He takes pride in helping his friends and fellow boxers, especially Ippo, whom he has personally taken under his wing. His current aspiration is to conquer the next four classes up through heavyweight. Ippo's senpai and Kimura's best friend. Aoki provides much of the gym's comic relief and exercises one of the world's most unusual fighting styles. In the past, he and Kimura were the toughest high-school thugs around, but now Aoki's real job is at a ramen restaurant. He shares an apartment with his girlfriend, Tomiko, a friend of Kumi Mashiba whose nice personality and good body more than compensate for her less-than-stellar face. His current record stands at 10?6?4, with 6 KOs. Ippo's senpai and Aoki's best friend. He is the smooth, collected type and a romantic at heart, but trains as hard as anyone. His style incorporates a fast left and faster footwork. In the past, he and Aoki were the toughest high-school thugs around, but now Tatsuya's real job is at his family's flower shop. His current record stands at 13?5?3, with 8 KOs. After losing to Ryo Mashiba, he announced his retirement from boxing. Shortly after, unable to stay away from boxing, he returned saying he would spell his name in katakana (タツヤ, Tatsuya) instead of kanji (達也, Tatsuya). The most recent addition to the roster, the charismatic Manabu has a prodigy's talent and was the captain of his high school's boxing team. Cheerful and a lover of bad puns, Manabu is a fierce outboxer with extremely high speed and reflexes and whose fighting style is uncanny in its resemblance to Miyata's. He is also one of the very few people who has connected on some level with Ryo Mashiba. Outside of boxing, Manabu is employed as an assistant at the Makounouchi family's fishing business. His current record as the Rookie King of his class stands at 8?1?0, with 6 KOs. Kumi is Ryo Mashiba's sweet-natured, but hard-working and willful younger sister, and as such understands him better than anyone else. She will do almost anything to support her brother and make him happy. Ippo becomes infatuated with her early on, but did not have a chance to tell her until more than a year later, when they met in an hospital as patient and nurse some months after the Ippo/Mashiba match. They become friends and Kumi comes to like Ippo back, but their relationship tends to suffer from their friends' and relatives' constant interference. Known by ringnames such as the "Executioner" or "Shinigami (God of Death)" by those who watch his matches, Mashiba is one of the most intimidating boxers in the series. He later moves to Junior Lightweight Division where he reigns as Champion (defending the belt against Kimura, amongst others) before losing to Sawamura by disqualification in one of the dirtiest matches ever seen in the series (even knee strikes were present!). His greatest strengths are his height and incredible reach for his weight division, almost three inches longer than Ippo's. Outside of the ring, Mashiba is a very quiet, if also very unnerving figure who is spurred on to earn wages and box for prize money all to support both himself and his beloved younger sister, Kumi, orphaned after their parents died in a tragic accident many years ago. He holds a record of 17?2?0, with 13 KOs. Brash and fearless, Sendou is the hero of Osaka's boxing fans, to whom he is known as "Rocky" or the "Naniwa Tiger". He is considered to be a superior infighter to Ippo at mid-range. He has held the Japanese featherweight championship once after Eiji Date's retirement (defeating Alexander Volg Zangief by decision), defending it twice by KO, and some time later, he loses his Featherweight belt to Ippo by KO. Sendou is Ippo's greatest rival, next to Miyata. He has a record of 17?2?0, with 16 KOs; both losses were against Ippo. 14 Strong Arms! 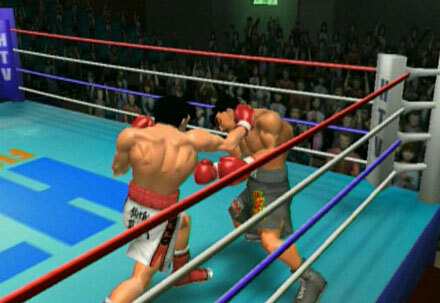 Hook vs Uppercut! why, why, why, why? I want to dive!